In this construction video tutorial, you will learn the tips to work out proportion of water & cement in concrete. 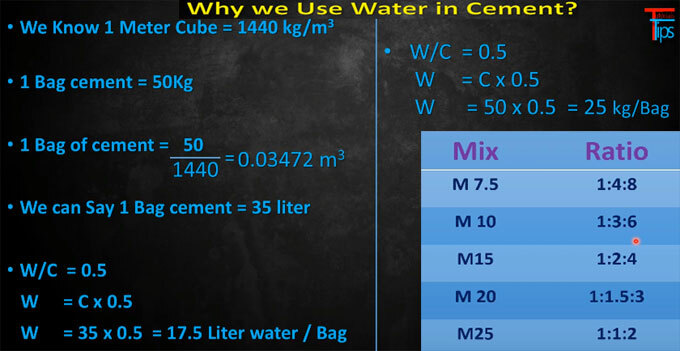 In civil engineering term, water cement ratio signifies the ratio among the weight of water to the weight of cement that is applied in concrete mix. Alternatively, it means the amount of water to be utilized in the cement concrete. The water cement ratio provides a great impact on the strength of concrete. If less amount of water is employed for cement concrete, the strength of the concrete will be better. If the water is not utilized in cement concrete, the concrete fails to blend. So, water is considered as a major component for cement concrete to associate all the material with each other for maintaining the superior strength of any construction work. Generally, the water cement ratio remains at under 0.4 to 06 according to IS Code 10262 (2009) toward nominal mix M7.5, M10, M15, M20 and M25. W = 35 x 0.5 = 17.5 liter water/bag.